The 5th Conference on Laboratory Approaches to Romance Phonology (LARP 5), formerly the Conference on Laboratory Approaches to Spanish Phonology (LASP), took place from September 23-25, 2010 at Brigham Young University. This volume contains 14 papers selected from those presented at the conference, divided into sections on segmental phonology and prosody. The entire proceedings is now available on our web site. This volume contains 15 papers selected from more than 100 presented at the 2010 Second Language Research Forum, which took place from October 14-17, 2010 at the University of Maryland at College Park. The entire proceedings is now available on our web site. This volume contains 22 papers selected from those presented at the 2010 Conference on Generative Approaches to Language Acquisition North America, which took place from September 1-3, 2010 at the University of Toronto. The theme of the conference was "insights from cross-population comparisons." The entire proceedings is now available on our web site. This volume contains 17 papers selected from more than 100 presented at the 40th Annual Conference on African Linguistics, which took place from April 9-11, 2009 at the University of Illinois at Urbana-Champaign. The papers include Ayo Bamgbose's keynote speech and the plenaries from Brent Henderson and Lioba Moshi. The remaining papers are divided into sections on language acquisition, morphology and syntax, phonetics and phonology, and sociolinguistics and language variation. The entire proceedings is now available on our web site, and the printed edition will be shipping in January. This volume is highly recommended to researchers in the fields of SLA and psycholinguistics, as well as to students or any other parties that require an up-to-date knowledge of issues in current SLA research. The diversity of this volume guarantees that researchers from a variety of different fields in psycholinguistics will find some interesting experimental findings and suggestions, as well as use them as a starting point for future research. The full review, including a detailed investigation of each paper, is available on the Linguist List. You can order a library bound copy of the proceedings, or read the papers online, at Cascadilla Proceedings Project. This volume contains 16 papers selected from the 37 presented at the eleventh conference on Generative Approaches to Second Language Acquisition (GASLA 2011), which took place from March 25-27, 2011 at the University of Washington (UW) in Seattle. The papers include Heather Goad's keynote speech. The entire proceedings is now available on our web site, and the printed edition will be shipping in November. In a Linguist List review, Sara Candeias writes, "The Selected Proceedings of the 4th Conference on Laboratory Approaches to Spanish Phonology provides an important contribution to the state of the art of Spanish phonological analysis, including both European and American varieties, as well as the speech of monolinguals and bilinguals." You can order a library bound copy of the proceedings, or read the papers online, at Cascadilla Proceedings Project. Changes in the current edition include updates and new information that improve an already exceptional and highly practical text.... When I teach with this text, I find the almost uncontainable urge to remind students how lucky they are to have it and to tell them that I did not have this text 'when I was a graduate student'. I do resist, though, but I will say now that graduate students will immensely benefit from this text, and yes, I do so dearly wish I had this text 'when I was a graduate student'. Go to the Cascadilla Press web site to buy your own copy of the new edition of Surviving Linguistics or to order 10-packs for your department. We recycle everything we can, so we were delighted to discover the CD Recycling Center of America is just 30 minutes up the road from us in Salem, New Hampshire. In clearing out some space this summer, we found a few thousand CDs that we had set aside years ago until we could find a way to recycle them. The components in a traditional jewel case CD package—the CDs, the CD trays, the paper inserts and tray cards, and the jewel cases—have to be separated and recycled through different processes. Only the paper parts are easily recyclable locally, but the CD Recycling Center in New Hampshire recycles all of the components properly. And now a carload of our old CDs can become parts for new cars instead of landfill. This volume contains 13 papers selected from among those presented at the 32nd Annual Second Language Research Forum, which took place from October 29-November 1, 2009 at Michigan State University in East Lansing. Together, the papers reflect the theme of the conference, Diverse Contributions to SLA: Integrating the Parts of a Greater Whole. The entire proceedings is now available on our web site, and the printed edition will be shipping in July. Do you long for a world where linguistics is a popular sport? We have added a new light-hearted poster to our CafePress shop: a chart of hand signals used by syntax referees in that better world. To buy the poster, go to www.cafepress.com/cascadilla. This volume contains 34 papers selected from among those presented at the West Coast Conference on Formal Linguistics, which took place from February 12-14, 2010 at the University of Southern California in Los Angeles. The papers are grouped into those from the general session and those from the special session on prosody, and include the keynotes from Richard Kayne and Sun-Ah Jun. PDFs of the entire proceedings are now available on our web site, and the printed edition can be ordered through our order form. We’re trying out a 100% post-consumer content recycled paper (Boise Aspen 100) for the office laser printer, and it’s working great. No paper jams and no paper feed problems in the first few reams. We printed 2000 pages on that printer last week, so making a change like this can have an impact. The only drawback is an occasional large dark speck in the paper, which may mean occasionally reprinting a page of proof. If we didn’t have to proof lots of pages with small diacritics, it wouldn’t be an issue. You can buy this paper from OfficeMax or Costco. Hope you’re enjoying Earth Day! 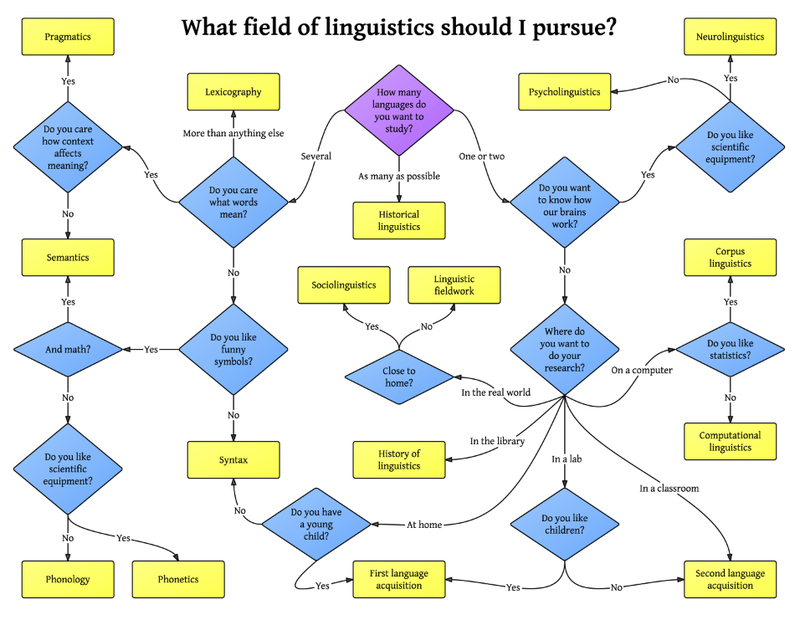 We have a new poster in our CafePress shop: a flowchart showing how you can choose what field of linguistics to pursue. Answer the questions, follow your path, and confirm that you're in the right field. Cascadilla Press will be displaying some of our books and teaching aids at the 18th Austronesian Formal Linguistics Association (AFLA 18) at Harvard University from March 4-6, 2011. We'll be there on Friday from 2:30-5:00 and on Saturday from 12:00-3:00, and we have a special surprise for conference registrants! Surviving Linguistics and our bumper stickers were featured in the promo clips leading up to this local news feature about the LSA meeting and Pittsburghese. 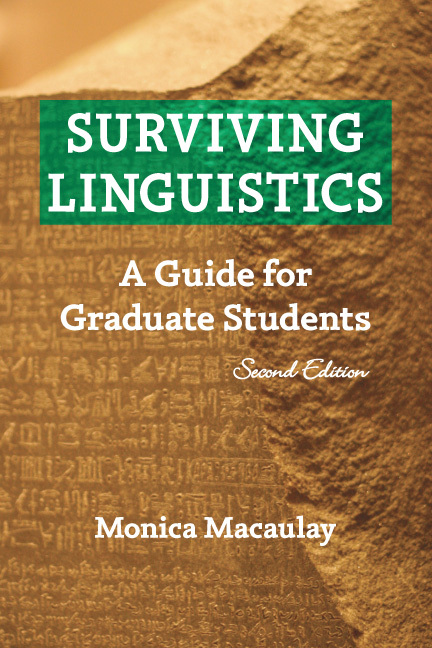 Cascadilla Press is delighted to announce the second edition of Surviving Linguistics by Monica Macaulay. This fully updated edition contains new advice about PowerPoint presentations, conference poster sessions, citations and citation managers, funding sources, and applying for grants. There are revised and expanded sections on informed consent and human subjects, preparing to submit a journal article, and job options for linguists. Undergraduates will find guidance on preparing for grad school in linguistics, with advice on choosing, applying to, and visiting graduate programs. Surviving Linguistics is a valuable resource for students at any stage of their graduate career, from learning to write linguistics papers through completing their dissertation and finding a job. Along the way, the author explains the process of submitting conference abstracts, speaking at conferences, publishing journal articles, writing grant applications, creating a CV, and much more. Throughout Surviving Linguistics, Macaulay emphasizes the importance of working with advisors, dissertation committees, and fellow graduate students. The second edition includes new exercises as well as helpful references to many new books and online resources. "The new and improved second edition of Professor Macaulay's book contains a wealth of useful information, practical suggestions, and valuable resources about the field of modern linguistics. The book should be required reading for any student pursuing a graduate degree in linguistics."